3 negatives : b&w; ; 120 mm. Published in Rafu Shimpo, August 18, 1967, English section, and August 24, 1967, Japanese section. Odori Festival of Japan troupe practices at the Music Center prior to its performance at the Ahmanson Theater, and troupe members at Los Angeles City Hall, Los Angeles, California, July 31, 1967. 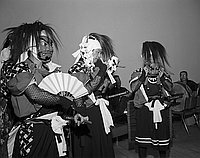 1N, 2N, 3N: Three men in Japanese folk costume don Oni (Ogre) masks and perform Oni-kenbari (Dance of the Demons) with swords to taiko and flute accompaniment. 5N: Shizue Fujikage, lead dancer and choreographer of the Odori Festival of Japan troupe, presents Los Angeles Deputy Mayor Joseph M. Quinn, a Caucasian man in dark suit, with a hand carved Shishigashira (lion's head) holding a stick in its mouth. They are surrounded by five Japanese women in kimono. Typed on original envelope: Music Center -- Odori Festival of Japan.